The young collector holds a medal showing a profile head of a woman in classical costume. His arm rests on an ornate chair with carved and inlaid decoration. A replica of the antique statue of Apollo Citharoedos stands on the elaborate table; the original was in the della Valle collection in Rome in 1561. Different identifications have been proposed for the aristocratic sitter, including that of Paolo Capranica, related to the Della Valle family, or a member of the Palma di Cesnola family, because their motto Oppraesa Resurgam appears on a scroll across a palm tree in the table inlay. The view of an imaginary landscape with a classically-draped figure leaning on a mannerist balcony gives the portrait an enigmatic air. Allori was a pupil of Bronzino and shares his ideal of polished refinement in portraiture. 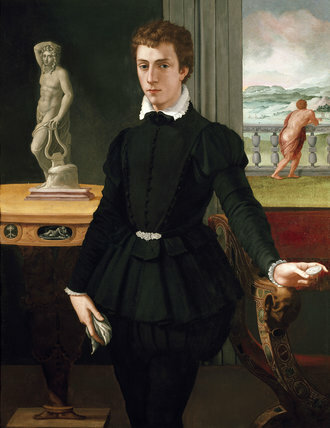 A1123 was painted soon after Allori's return from Rome, where he had studied antique and modern art from 1554 to 1560 and had established himself as a portraitist.